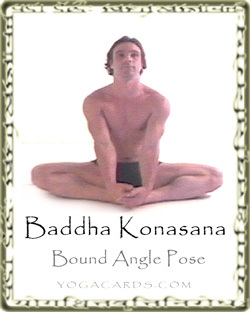 From a seated position bend the knees towards the chest then open them out. Use your hands to push the knees down a little more and hold the feet or big toes. The lower legs (below the knees) rotate inward. This means that certain muscles, tendons and ligaments in the knee need to be flexible. Common Faults The lower back curves out due to inflexibility in leg and tendon muscles and in the hips. Try to raise up with the chest and navel. At the same time turn the hips and tailbone back. This pose will increase groin flexibility (pectineus, adductor brevis and adductor longus, the gracilis and adductor magnus). The shoulders and surrounding area is also stretched away from the spine (rhomboideus major and a little higher the rhomboiduus minor . Muscles and tendons in the knee are also stretched and the quadiceps are stretched. Grabbing the big toes will stretch then towards the body. The big toes have to be stretched this way in various different yoga postures. They have to become more flexible inwardly so that they can be perfect in Tadasana the Mountain pose and stabilize the mild inward rotation of the legs and hips.